Summer is the time we might have gluts of vegetables from the garden or allotment (or even just in the fridge) to use up and we start to get really creative in how to incorporate them into our food. Baking with courgettes might be unusual but it is an excellent way to include more veggies in your diet! The excellent debut book from my blogging friend Kate Hackworthy from the blog Veggie Desserts, called Veggie Desserts + Cakes, has recipes for baking cake, brownies and other baking treats all featuring vegetables! Kale and apple cake, pea and vanilla cake, cucumber and lemon cake (with gin icing! ), carrot gingerbread, spinach and strawberry Swiss roll and carrot meringue pie are just some examples of recipes you’ll find in Kate’s book. 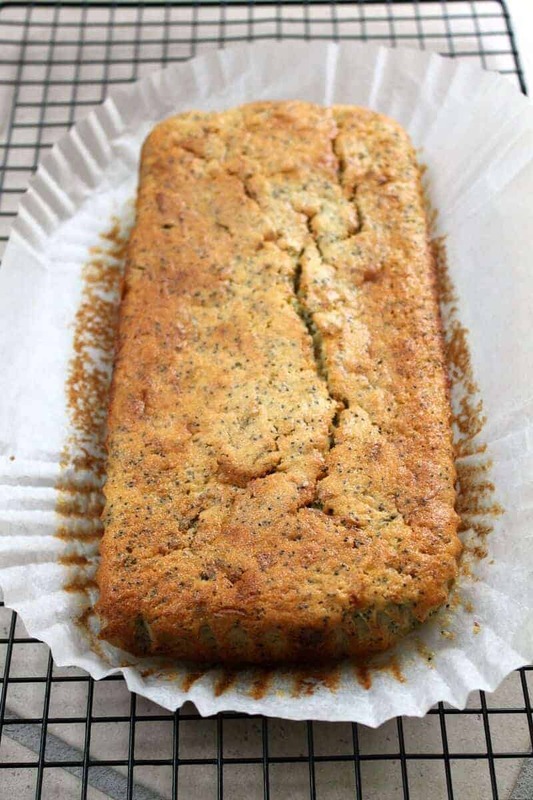 I decided to try out the recipe for courgette and poppy seed loaf cake as I absolutely love courgettes (or zucchini) and have never baked with them! Would you be able to tell there was courgette in this tasty cake do you think? Including vegetables in baking recipes is a great way to add goodness and nutrients as well as to enhance the flavour of course. You’ll be astounded by the amazing recipes you’ll find in Veggie Desserts + Cakes, I mean how about sweetcorn cookies with blackberry glaze or spiced butternut squash muffins! Now, Kate’s recipe includes a lavender and lemon glaze, but as I didn’t have any culinary lavender to hand I just used a lemon glaze instead. My taste testers (kids) wolfed this down and really enjoyed the flavours. They leave all trace of courgettes when I serve them to them usually so this was a great bonus! Even before adding the icing the recipe produces a delicious loaf cake, with just a few small hints from flecks of colour you can spot within to indicate there is something a bit out of the ordinary in here. Making vegetables the star of the show is something Kate’s excels at, and the delicious recipes in her book show this to a tee. I’ve loved looking through all the recipes and have plans to try the pea and mint cupcakes with rose water buttercream and spinach and almond shortbread very soon. I’d recommend you get this book (out now, published by Pavilion, available from Amazon at £14.99) if you want to try something new in your baking. 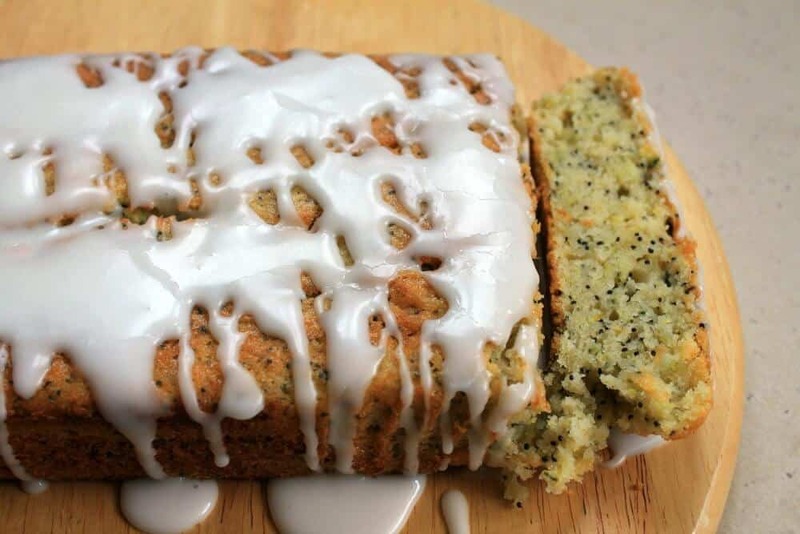 I’m very pleased to say that I have been given permission to share the recipe for the courgette and poppy seed loaf cake with you. Read on for the recipe and make sure you order your copy of Veggie Desserts + Cakes to enjoy all the other recipes! Preheat the oven to 180 C/160 fan/350 F/gas 4. Lightly grease and line a 1 kg/2 lb 4 oz loaf pan. In a large bowl, beat the butter and sugar with an electric mixer for a few minutes until light and fluffy. Add the eggs, one at a time, and beating each one in well. Beat in the courgette, lemon juice and zest. Sift in the flour and add the poppy seed. Mix gently to combine. Pour into the prepared pan, level to the edges and bake in the oven for 40 minutes, or until a skewer inserted into the centre comes out clean. Gently heat the lemon juice in a small saucepan. Remove it from the heat, add the lavender and allow to infuse for 10 minutes. Over a bowl, strain the lavender out of the lemon juice. Beat the cooled infused lemon juice with the icing sugar until smooth. 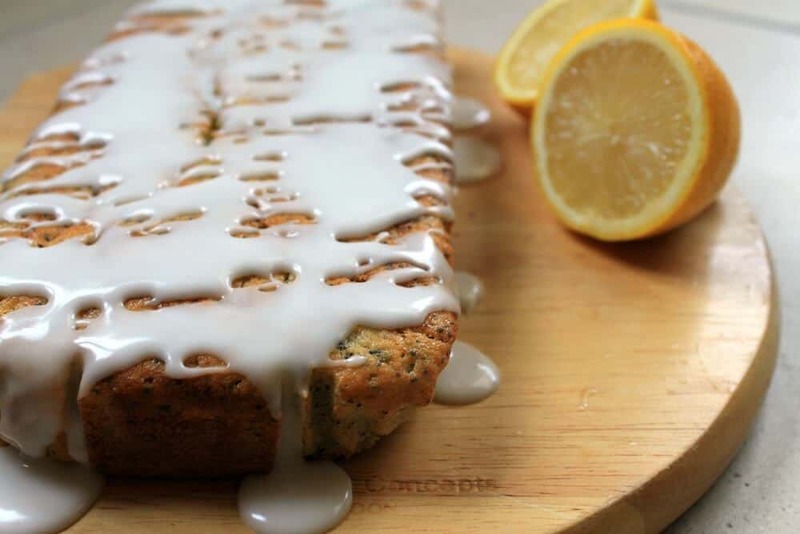 Drizzle over the completely cooled cake and decorate with lavender and lemon. 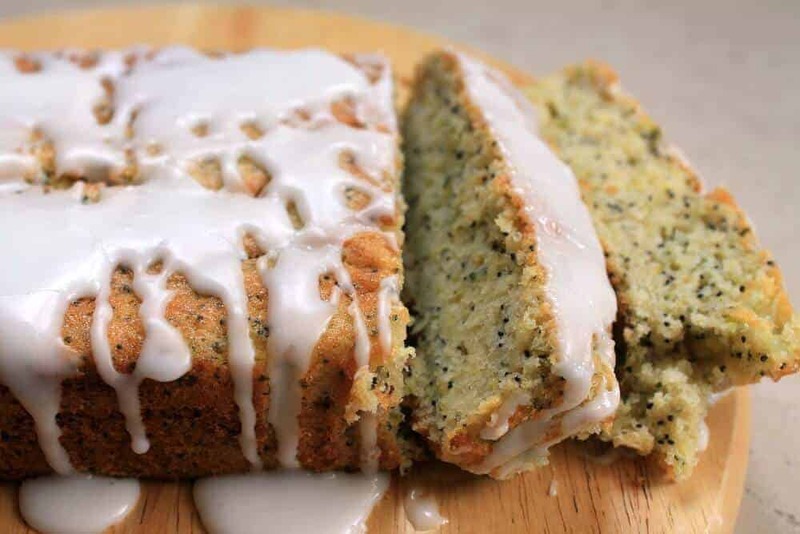 Pin this courgette and poppyseed loaf cake from Veggie Desserts for later! Disclosure: post contains affiliate links. I received a complimentary copy of the book to review, but all opinions are my own. Oh blimy, I could happily eat this for breakfast! I love the look of this, I think courgette is great in cake, it locks the moisture in. Yum! What a stunning recreation of Kate’s recipe! It looks so like the image in the book. 🙂 I adore Kate’s book so much and have tried two recipes – Avocado Chocolate Cupcakes with Cherry Icing *and* Sweet Potato and Salted Hazelnut Cookies. In fact, I’ve made three different sorts of tweaky batches of the latter! I just know that anyone who buys this book will get a lot of use – and joy – from it. 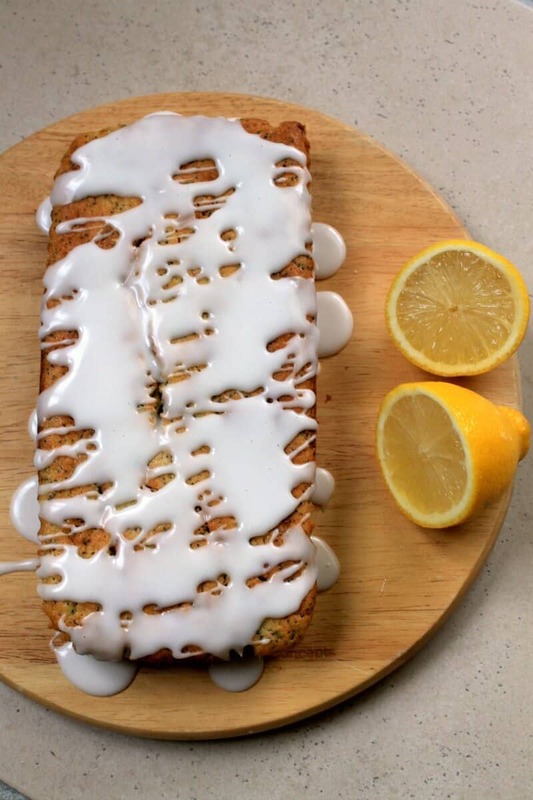 This looks amazing, I love lemon in cakes! And courgette too! Ah, another one of Kate’s gorgeous recipes! Courgette seems to work very well in baking recipes. I love cakes and bakes that use courgettes – as we have an allotment there are always courgettes in our kitchen needing using! This looks delicious Lucy. 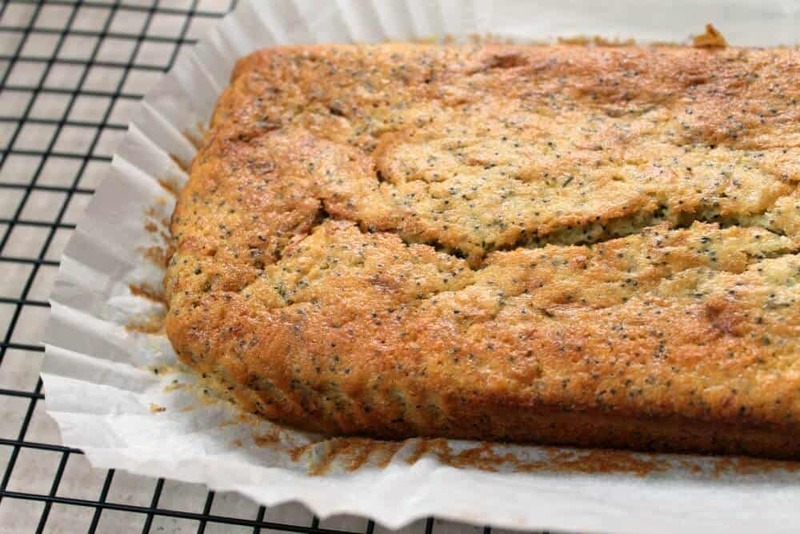 Lemon and poppy seed cake is a great favourite with us, but I can imagine it would be even better with courgettes to give it a fleck of green and keep it nice and moist.